Ideally, unions would recognize their moral and ethical responsibility to routinely inform their dues paying financiers of their financial dealings. But whether out of self-interest or suspicion, union officials in Michigan and elsewhere typically resist disclosing financial information and can seldom be relied upon to provide anything but sketchy data voluntarily. Unfortunately, a full remedy to the problems outlined abovea remedy that would affect all 938,300 unionized workers in Michiganis not available without changes in the federal National Labor Relations Act (NRLA). This would require federal action, which is not likely to occur. Any effort by a state governor or legislature to improve union financial disclosure at the vast majority of private firms would almost certainly be struck down on the ground that state action has been precluded by federal law. On the other hand, the NLRA does not apply to state or political subdivision employees. 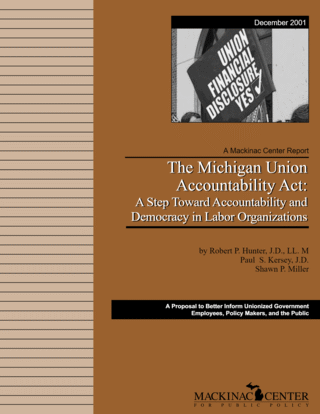 Public sector unions representing state and local government employees are created and regulated under state law, so Michigan has a free hand to deal with the union financial disclosure problem with regard to roughly one-third of Michigan's unionized employees. The best course of action, short of barring agency fees outright, is to amend Michigan's Public Employment Relations Act (PERA) to require public-sector unions to report their financial transactions annually. Public-sector unions could be required to detail their spending according to functional spending categories, such as contract negotiation, grievance processing, campaign contributions, public relations, and organization expenses. Reports could be audited by an independent accounting organization to assure accuracy and consistency. Such an amendment could make it an unfair labor practice for a union to fail or refuse to prepare a report. The effectiveness of such a reform of union disclosure laws would be enhanced by computerization and posting on the Michigan Department of Consumer and Industry Services web site. The text of such a proposed amendment can be found in the Appendix to this report. PERA already regulates the conduct of both employers and unions with respect to their dealings with employees. In PERA's language, it is "unlawful for a public employer or an officer or agent of a public employer" to "interfere with, restrain, or coerce public employees in the exercise of their rights guaranteed by PERA." Similarly, PERA provides that it is an unfair labor practice for a union or its agents to restrain or coerce public employees in the exercise of their rights guaranteed in the statute. The failure of unions to report and accurately account for their income and expenses to their members should be viewed as a restraint on employee rights to self-organization, democratic union governance, and the pursuit of mutual aid and protection which the law should recognize and protect. Amending PERA to require unions to disclose their finances also makes sense because the law already provides an efficient method for employees to act when a union fails to comply with the statute. 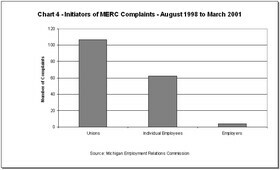 Individuals can, without charge, file a complaint with the Michigan Employment Relations Commission (MERC), the state administrative agency charged with enforcing the law. If a trial is ordered, it is relatively simple for employees to represent themselves and prove the complaint by testifying that they did not receive the documents requested according to the law. If financial disclosure were combined with this remedy, the burden would be on the union to demonstrate that it accurately prepared the financial documents and disclosed its financial condition and operations to complaining union dues-payers. MERC would make the ultimate decision who was in the right, and, assuming the statute had been violated, would order the union to comply with the statute. PERA's process is relatively inexpensive and fairly expeditious. As Chart 4 illustrates, more than one-third of the complaints filed under PERA during a recent period were filed by individual employees. An individual need not hire a lawyer and there are no filing fees for originating a complaint. There are some secondary costs such as taking time away from an employee's job to prosecute the case and paying for transcript costs. But these expenses are relatively modest compared with court costs and expenses resulting from a traditional litigation. In this type of case, where the facts and law would be fairly straightforward, MERC can make a rapid decision. Remedies for refusal to provide financial information could be designed to provide the right incentives to encourage unions to be accountable for their members' good faith. For a first violation, the union could be required to return all agency fees collected during the period when disclosure should have occurred. If the union cannot account adequately to employees how their dues have been spent then the refund of worker money is an appropriate remedy. An intentional refusal to provide the information or a second failure to report to employees could result in an employee electionin addition to the refundat the conclusion of the existing collective contract, by a government-sponsored secret ballot. The workers could vote on whether the union should be removed or replaced. At that point the union would have breached its trust with employees, just as a business would if it refused to disclose its financial information. A referendum on the union's continuing authority to represent them would best be best placed in employee hands. The remedial approach taken by the model law strikes a proper balance between securing the unions' compliance with the law and reimbursing employees when the union fails. Ultimately, the cases before MERC would become rare indeed because unions would quickly develop the necessary accounting and reporting procedures needed to routinely inform their members as to sources of income and the nature of expenditures in their behalf. Compiled from case descriptions on MERC website, covering period from Aug. 1998 to Mar. 2001.